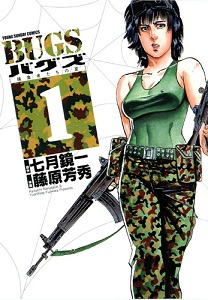 The Special Operations Group (SOG) is a highly classified anti-terrorist division of the Japanese military. Their current mission has taken them into Fukui Prefecture where terrorists have attacked a nuclear plant and have escaped into the mountains. Of the 4 squads, the second squad is lead by Ibuki Aran known to be one of the most combat ready soldiers and who also happens to be the only female member of the SOG. But nothing could prepare the special forces for the enemies that they were about to face. Mutated insects hundreds of times the normal size start attacking the SOG. The praying mantis with its incredible speed and razor sharp legs or hornets with giant stingers which attack in massive numbers. As highly trained soldiers are taken out swiftly, it is up to Ibuki Aran to make sure her comrades stay alive. One day, a 15-year-old girl comes into 'hard-boiled' detective Kataoka Heihachirou's office. The girl, Mizunomori Taira, gives him the shock of his life when she announces that he is her father! Her mother, Seiko, had died in a traffic accident, and Taira had decided to seek out the father she had never met. Heihachirou may be crass, sloppy, sexual and have no idea how to care for a daughter, but he takes her in. Taira and her "heart-boiled" detective papa begin their daily life together, a life neither of them could have expected! The dying wish of Ikkyuu’s grandpa was for him to take good care of the temple. But with the temple being used as the collateral to a massive debt and Ikkyu still only in high school, it seems inevitable that the land would be sold off. Ikkyuu realizes how important the temple is to the community and remembers the promise he made to his grandpa and takes a long shot: going to a loan company through a recommendation. There, a man named Kawachi agrees to pay off the large debt under one condition: Ikkyuu must participate in an underground fight club called the Clash Club where people watch and gamble online on a street fight with absolutely no rules. 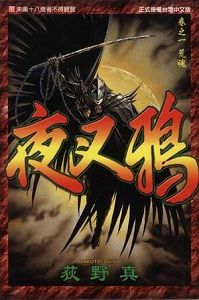 Ikkyuu must keep winning to save the temple and save his life that hangs by a thread with every fight. 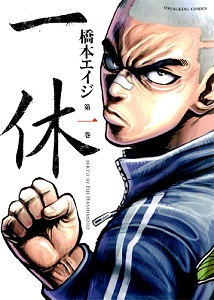 Inudzuka Taromaru is a first year high school student who looks like a delinquent. One evening, while he's at his part-time job, he ends up with a white-feathered arrow through his head! He's told that this arrow means he has been chosen as the sacrifice for "Inugami-Hime," who lives on top of the nearby mountain. 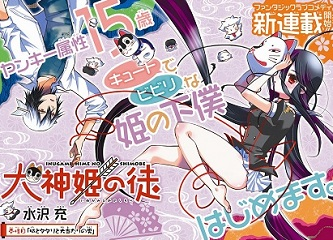 However, this mysterious "Inugami-Hime" turns out to be a cute girl who has chosen him to be her servant, not her sacrifice. Their life together is just beginning! During the feudal era, warlords were not only in danger from enemies outside the castle, but also from within like their own lieutenants they trusted. To protect themselves, they secretly began to use decoys of themselves. Honda Masanobu was part of Tokugawa Ieyasu’s council and also his closest friend. 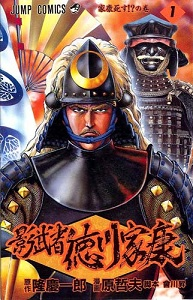 However, to defend his home country from Oda Nobunaga’s campaign, he leaves his position. During the 10 years on the battlefield, he meets Jirosaburo Motonobu who looks almost identical to his former master. Masanobu comes to realize that Jirosaburo must become Ieyasu’s shadow because of his trustworthy character and battle experience. With the death of Toyotomi Hideyoshi who ruled the unified Japan, two forces, Tokugawa Ieyasu and Ishida Mitsunari, were clashing for the throne. As Mitsunari was taken care of by Hideyoshi, he stood forth to prevent Tokugawa from stealing the power from the Toyotomi name, although he personally did not wish for such power. As Mitsunari’s closest ally and dear friend, Sakon Katsutake of the Sawayama Castle turned the tide in the country’s most historic battle, Sekigahara. 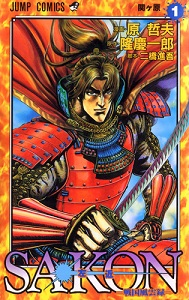 Although Mitsunari eventually falls, Sakon lived on to greatly influence the post feudal era in Japan. Nachi Takeru is a young man who supervises a mountain shrine, where three teenage girls also work. Takeru can't get into any good colleges, but he figures that he's destined to run his family's shrine, anyway. The three girls are working at the isolated shrine for various reasons, and they sometimes complain about being so far away from cute boys (other than Takeru) and civilization. However, aside from the peaceful mountain shrine life, Takeru also uses his shinto powers to defeat powerful evil spirits (Aradama) as the protector Yasha Garasu! "Ore ga Heroine..." was a cool idea. It gives the writer a chance to use a bunch of very different stories and art styles in the same manga, and I think it could develop into something really fun. 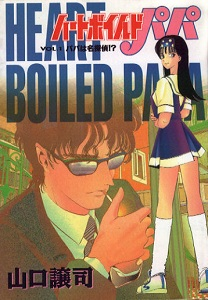 Heart-Boiled Papa also looked promising. It's not a new concept-- someone with no business being a parent ends up with a child they never new existed-- but those kinds of stories can sometimes be quite interesting. Couple feudal era - Oda Nobunaga/Tokugawa Ieyasu stuff for me. Personally, I dont like historical series especially with overused people like them. But if you like the history genre, check it out. 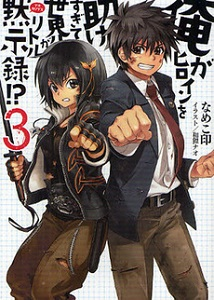 Ikkyuu - new series about an underground fight club with high school age teenagers. On the violent side but I enjoyed reading it. The new opponents he faces each time is interesting and I'm excited to see how he overcomes each fight. If you haven't done so already, check out the scanlations of the mangas from previous shout outs which have been recently scanlated: supernatural comedy Sky Blue (MH link). Bugs: Predator's Summer sounds like Ghost in the Shell AU fanfiction. But I still would love to read it! Ore ga Heroine would be interesting to read, it sounds a bit like Tsubasa Reservoir Chronicles, but a harem version.